Pieces of Her is the latest novel from international bestselling author Karin Slaughter. 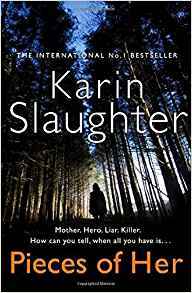 I have to put my hands up and admit that I have never read a novel by Karin Slaughter so I went in with no expectations! Pieces of Her is a complicated novel weaving in and out from 1986 to the present day. Andrea (Andy) Oliver always thought she knew her Mum, Laura. Now living on her own after separating from Gordon, the man Andy always treated as her Dad, Laura is a successful speech pathologist in her middle years. After Laura had a breast cancer diagnosis, Andy packed up her bags and left her New York house share to assist her Mum in any way she could. Andy never settled into the New York scene, always an outsider living a very lonely existence, so the move back home was one that suited her. Laura and Andy meet regularly for lunch dates and it is on one of these days that Andy’s life changes forever. An attack on their lives in the Mall sends Andy into shock but Laura reacts in the most unexpected manner and Andy witnesses her mother as someone else completely. Was this just self-defense? How did her mother know how to react in such a cold-blooded way? Who really is this woman? As video of the incident goes viral, Andy is about to discover that her mother is a person with an extremely complicated history, a person who has been hiding away from the world for years…but why? Andy gets embroiled in her mother’s story and as she searches for the truth, she soon discovers that her own life is in danger. Andy has to think on her feet and soon finds herself taking on the most daring and frightening challenges in order to just survive. Unfortunately, for me, Andy wasn’t a great character. Against the steely backbone of her mother, Andy was quite an immature individual. Her behaviour, at times, didn’t equate to that of a woman in her thirties and was more fitting to an older teenager or person in their early twenties. In parts of the book I did find her character to be somewhat irritating but that is only my own personal opinion. The story takes the reader on a fast-paced, intertwining narrative where you do really need to have your wits about you. There are some very dark personalities within this book that are brilliantly portrayed. The psychopathic traits are described very vividly which really gives the reader an insight into the degree of fear and terror that exists for some of the individuals involved. Pieces of Her is one of those books that I have quite mixed feelings about. There are many parts that I thoroughly enjoyed and other parts that I was very willing to suspend reality for, but I did find myself getting a little frustrated at times and putting the book to one side. But I persisted and I am so glad I did as the momentum picked up and I found myself completely caught up in the story. Pieces of Her is an exciting read. It IS a suspense novel and it most certainly plays with your mind, as you attempt, in my case very unsuccessfully, to figure out the truth behind Laura. Having read other’s thoughts on the novel I think that there will continue to be many differing opinions on this book. Will it satisfy fans of Karin Slaughter? We will just have to wait and see…but I do expect it will be another bestseller for the author.